Jennifer Cluff: Can flute scales be more interesting to work on? Can flute scales be more interesting to work on? "Can you tell me how to make my flute scale practice (or learning of scales) more interesting? I'm not particularly good at discipline, but I know I have to improve my technique." Well for these fabulous students, who like me perhaps, are not into discipline, but are into improving while remaining open-minded, creative, free and fascinated, I have updated my scale "how to" scale page for flutists. Do have a look. The new and improved flute scale collection of links and ideas is here. These aren't really creative or tricky, but help me to keep my scale practicing (and other technical workouts) interesting and productive. - Do them every day, but not for an overly long time. Reap the benefits of regular scale practice over the long term. - Keep scale practice goal-oriented. Try recording yourself playing a single scale. Listen back and pick out the top three things that need to be improved (missed notes? pitch? tone? speed? smoothness? ), and spend the rest of your scale time improving those things. Record again and re-evaluate. - Keep a practice journal, and refer back to previous entries often, to see how far you've come and to notice what problems you've noticed but haven't gotten around to fixing yet. Scales should keep a committed, creative musician engaged and busy for a very long time! If you're bored with them, you might be practicing on auto-pilot. Give each note the attention it deserves. I don't know if you can make scales fun hahaha but here's my tip. I try and make my students play scales relevant to the pieces they are playing. I do this by showing them at first any scale patterns in their pieces highlighting them with fluro markers at the start. Then we practice the relevant scales arpeggios etc before playing the piece. Soon the student can analise there own pieces and pick up the patterns and play the relevant scales. I find this helps speed up the learning of new pieces and gives a reason for doing the darn scales. My flute teacher recently got me to buy the Taffanel & Gaubert 17 Daily Mechanical Exercises. It is way beyond anything I would have been prepared to use when younger (i.e. a teenager) but as a more mature (nearly 50!) adult I make daily use of the ones she wants me to concentrate upon. I see you recommend it too! Yes, the T&G is a good compendium of technique. Well, if you want to throw MORE at the old brain, you can incorporate the learning of trill fingerings into the scale. Danielle Eden has a set of scales in her 'Piccolo, Piccolo 2' that is based on Eugene Damare's 'The Wren'. It has a triplet figure,(eighth note =triplet) followed by another eighth. The triplet figure can be used to learn trill fingerings; the same scale would require use of trill and regular fingerings. Thanks Rebecca. That's a very creative exercise and it works so well. 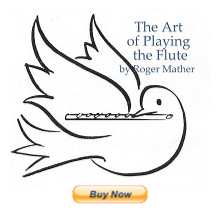 The new Paul Edmund Davies book "28 day warmups" has this exact method too, as does the Kujala daily exercise book called "The Flutist's Vade Mecum." Changing from trill fingerings to real fingerings is especially well covered in the Kujala book.